Following two rain delays, the second round of singles qualifying was completed Sunday at the BB&T Atlanta Open, held at Atlantic Station in Midtown. Former Georgia Tech standout, Kevin King, of Peachtree City, Ga. took out a current college player in Becker O’Shaughnessey of the University of Alabama. A spirited crowd enjoyed the shotmaking in the 6-3, 6-2, King victory. Even the group from Macon, O’Shaughnessey’s hometown was appreciative of both player’s effort. If you liked big serves and winners in each corner of the court, you would’ve loved the 7-6(7), 7-6 (5) victory posed by Australian John-Patrick Smith. Smith took out another former member of the Yellow Jacket tennis program in Juan-Carlos Spir, and it wasn’t easy. “Tough, tough, tough,” was what Smith was saying to himself at various times during the match. Spir served for the first set, but Smith was able to capitalize on two unforced errors to even the set that how would eventually take in a tiebreaker. The final match on Stadium Court featured 16-year old, Francis Tiafoe, who on Saturday won his first ATP World Tour match. The young American took on former LSU Tiger, Michael Venus of New Zealand. In the longest match of the day, Venus outlasted Tiafoe, 6-3, 6-7(3), 7-6(3). Tiafoe put on a great show in his ATP World Tour debut, and the remaining fans appreciated the effort. Tiafoe said it felt good to play in Atlanta. In other Sunday night action, Tour veteran American Rajeev Ram, always a dangerous player with his aggressive serve and volley game, defeated Jean-Yves Aubone 6-3, 6-2. 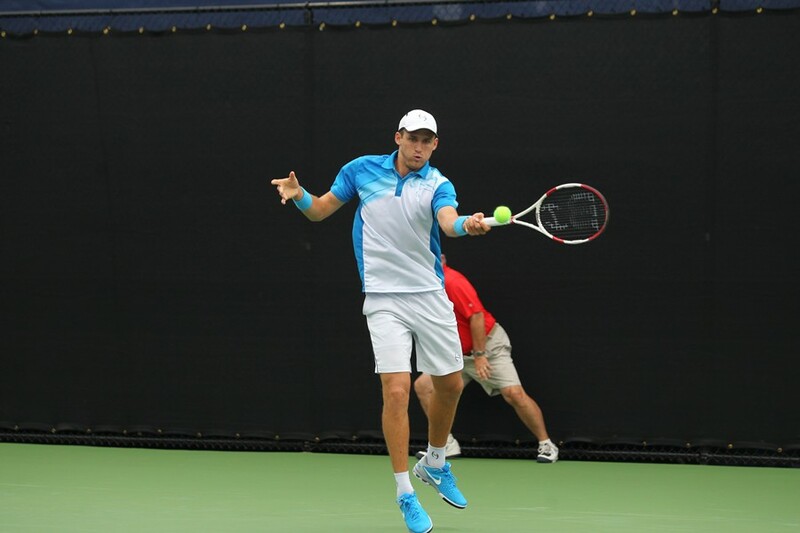 Illya Marchenko of the Ukraine also was able to defeat Fritz Wolmarans, 6-4, 6-3.